This explanation augments the guide in the manual and book, since users can have trouble with installing and configuring these applications, especially on Windows. For now this page is for Windows users - users of other operating systems can refer to the Configuring Jutoh appendix in the Jutoh book. Kindlegen is a utility to help Jutoh (and other applications) generate .mobi (Mobipocket/Kindle) files. The name is from "Kindle Generator". Kindle Previewer is an application to view .mobi files, so you can see what they will look like on various devices. Jutoh can be configured to make use of both of these utilities from Amazon. Kindlegen is a utility that you don't normally run standalone - it's something Jutoh must run. On the other hand, Kindle Previewer can be run standalone as well as from Jutoh. This will show the Kindlegen Installation dialog; now click on Download and Install. If all goes well, Kindlegen will be installed and Jutoh will now know where to find it. If there was a problem, you can download the Zip file from Amazon, extract it to a folder, and then click Browse in Preferences/Helpers to tell Jutoh where kindlegen.exe is. To test out the ability to create Kindle files, open the Lena sample from Browse Samples on the Help menu (or open your own project), select the Mobipocket configuration in the Control Panel, and press Compile. If Jutoh told you that Kindlegen could not be found, check that you didn't delete or move the original installation folder, and choose the correct location of the kindlegen.exe file in Preferences/Helpers. 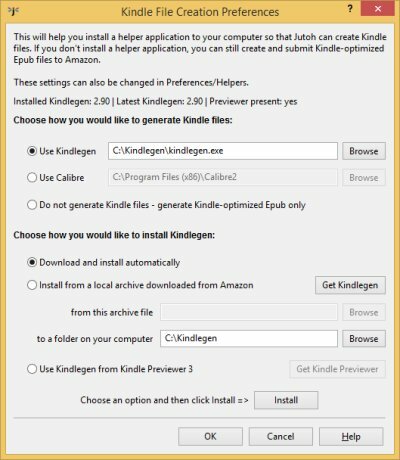 If the automated Kindlegen download failed, it may be because Amazon has changed the version and location of Kindlegen. Please email us about it and we'll update the web site file that tells Jutoh where to find Kindlegen. Meanwhile you can download it from Amazon directly. 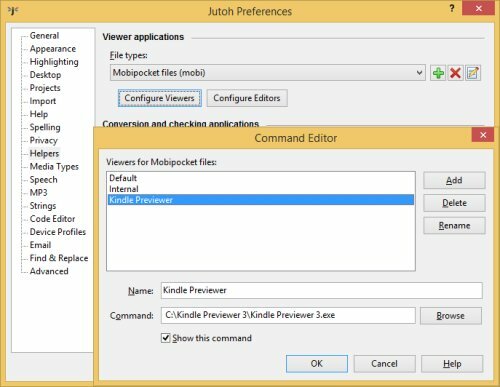 As before, you can get Kindle Previewer from Amazon, but it's easier to get Jutoh to download and install it because it saves you the configuration step. This time, you can only invoke automatic installation from the Setup Wizard invoked from the View menu (or shown when you first run Jutoh). Click Help Me Install Kindle Previewer. 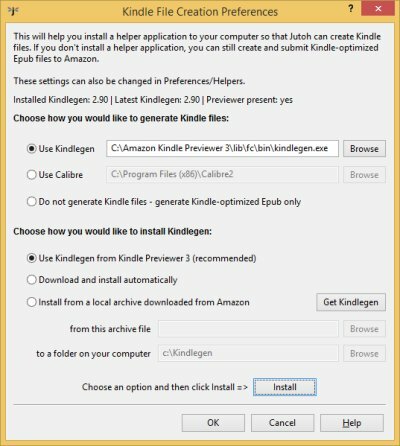 Jutoh will attempt to download Kindle Previewer - it's quite a large download - and install it. Jutoh will then add a Kindle Previewer command to the list of commands that Jutoh uses when you click on the Launch button. click OK to confirm this choice, and click OK again to dismiss the Preferences dialog. Now when you press Launch, you will be given a choice of the default viewer and Kindle Previewer. You can also find this location by right-clicking on the Kindle Previewer icon, clicking on Properties, and copying and pasting from the Target field. You should now be able to double-click on Mobi files to show them in Kindle Previewer. When you press Launch in Jutoh, 'Default' will invoke Kindle Previewer. You may wish to switch off the Kindle Previewer command in Preferences/Helpers to avoid a choice of viewer. One user found that Kindle Previewer wasn't working at all on Vista, when double-clicking on Kindle Previewer in the Start menu. Nothing was happening, with no error message. He found that he had to right click on the program and choose "Run this program in compatibility mode for Windows XP (Service Pack 3)". generate different formats using different configurations to avoid confusion (don't select multiple formats for one configuration).